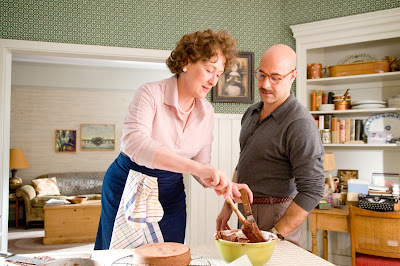 Integral to the story of Columbia Pictures’ new life-affirming comedy “Julie & Julia” is the support Julia Child and Julie Powell received from their husbands. “It’s about partnerships and how you can support each other in good times and bad,” says Meryl Streep. Playing the men behind their wives’ success are Stanley Tucci (“The Devil Wears Prada”) who portrays Paul Child, and Chris Messina (TV’s “Six Feet Under”) as Eric Powell. “Julie & Julia” seamlessly melds the two remarkable true stories of Julia Child, the woman who forever changed the way America cooks, and pioneer food blogger Julie Powell (who conquered every recipe in Child's cookbook “Mastering the Art of French Cooking”) into a comedy that proves that if you have the right combination of passion, obsession, and butter, you can change your life and achieve your dreams. Streep suggested to director Nora Ephron her “The Devil Wears Prada” co-star Stanley Tucci play the part of her onscreen husband Paul Child, the man who opened Julia’s eyes to the world of art, food and travel, nurtured her through the writing of her book, and ultimately cherished her rising popularity. 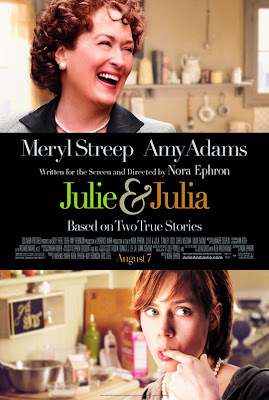 Opening across the Philippines on Oct. 14, “Julie & Julia” is distributed by Columbia Pictures, local office of Sony Pictures Releasing International. Visit www.sonypictures.com.ph to see the latest trailers, get free downloads and play free movie games.